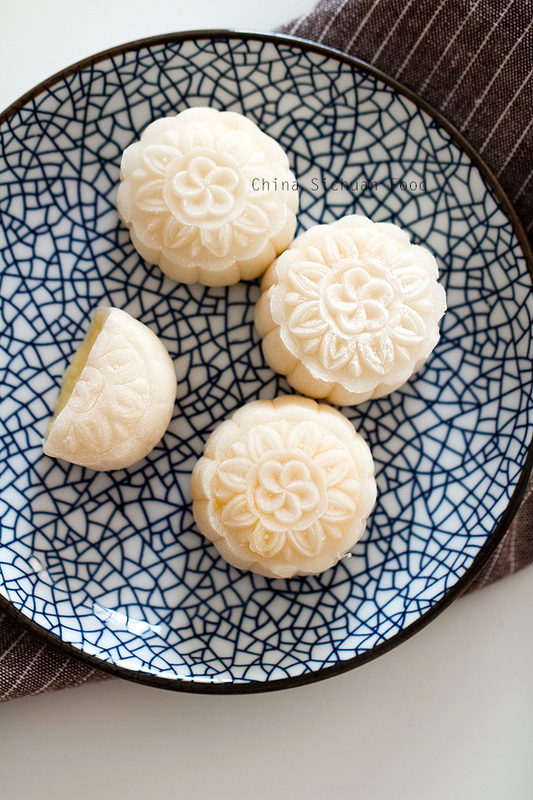 Snow skin mooncake (a video recipe) for traditional Chinese Mid-autumn day. This time, we are enjoying creamy custard filling. Mooncakes are the most popular symbolized festival food for our Mid-autumn day. There are a large group of mooncakes to choose in recent years. Snow skin mooncake is a new family member compared to traditional cantonese mooncakes. I am quite excited but also a little bit blue, as we will celebrate our Mid-autumn day in following two weeks. For me, mid-autumn day is the most important holiday along with the year because it is my birthday. Most people of my generation in China celebrate birthday based on our lunar calendar. 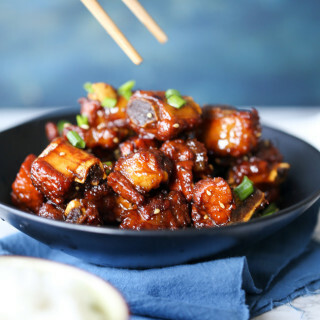 When I was still a young girl, my grandma always cooked yummy dishes, make mooncakes and Sichuan glutinous rice cake to celebrate my birthday. To me, the new city of Shenzhen is familiar but also strange. I do not have any relatives here. The emotion of missing my mom, dad and grand parents is becoming stronger and stronger. And my way to help me out is to make yummy food and share with others. So I make a large box of snow skin mooncake for my husband’s colleagues. If you prefer a colored version, check this post: snow skin mooncakes. 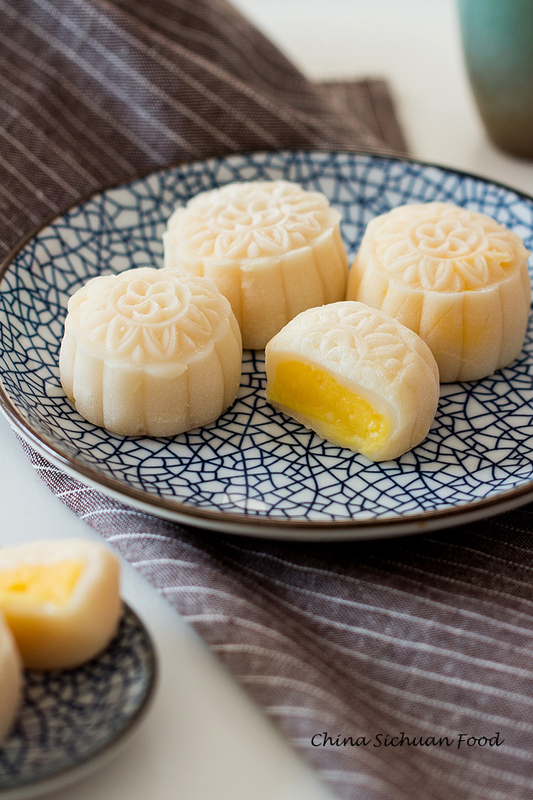 I use creamy custard filling for this year’s snow skin mooncake, as I just can’t reject the milky and creamy taste. And I have also posted a famous Dim Sum creamy custard bun previously using the same filling. To make the snow skin mooncake with the best results, I highly recommend measuring all the ingredients. And there are several tips before you starting making your own. To make the perfect custard filling, custard powder is necessary. It is firstly imported by some bakery stores in Hong Kong and now becomes a popular baking ingredient in Mainland China too. It increases the milky aroma and adds a light yellow color to the filling. However if it really too difficult to acquire, you can skip it with some sacrifice of the taste. And if you plan to skip custard powder, using more egg yolks can help to improve the color. Kneading the wrapper dough is another important tip. This will help to keep the wrapper soft after refrigeration. 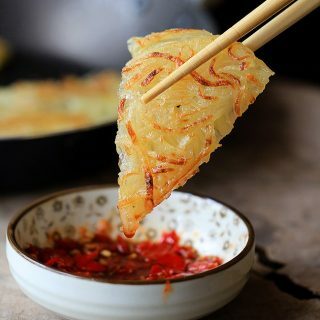 And usually the wrapper will be slightly sticky even after refrigeration; you can coat your hands with pan-fried glutinous rice flour or ware a kitchen plastic glove. In is important to coat the mooncake stamp each time before shaping, otherwise the mooncake might stick to the stamp. 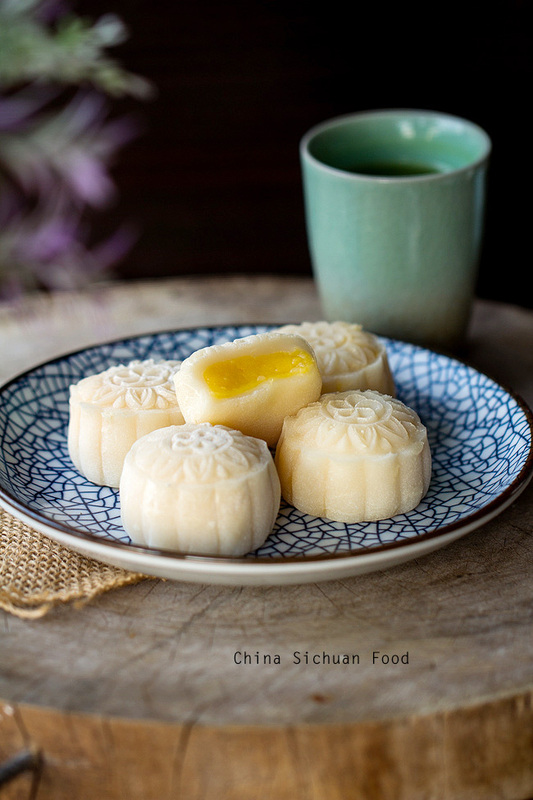 Helpful ingredient links from Amazon for the appearance reference: water milled glutinous rice flour, water milled rice flour, wheat starch, mooncake stamp. You can try to search them in large local asian stores. In a small pot over slowest heat, dissolve sugar with milk. Shift all the flours and custard powder quickly. Stir to combine well. Add egg and butter in. Keep stirring forcefully in the whole process to combine everything and avoid caking. Heat until the mixture becomes very thick and form a paste texture. Remove from fire and keep stirring for several minutes until it becomes fine and smooth. Transfer out, cool down and cover with plastic wrapper. Refrigerate for several hours until hardened so you can shape the filling easily. Combine milk, sugar and oil well and then mix with wheat starch, rice flour and glutinous rice flour. Strain once and set aside for 30 minutes. Cover with plastic wrappers and steam over high fire for around 30 minutes until it becomes slightly transparent. Transfer out and stir with chop stickers forcefully for several minutes until fine and smooth. Transfer to a plate and cover with plastic wrapper. Knead with both hands for several minutes until the surface becomes oily. (This is really important to have a soft taste wrapper, so do not skip this). Refrigerate for at least 4 hours before assembling the snow skin mooncake. 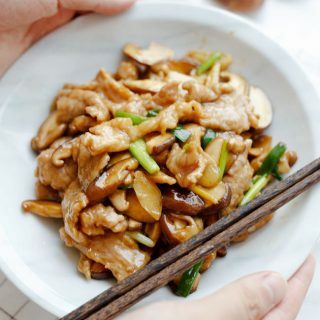 In a fry pan, stir fry raw glutinous rice flour on medium low heat until the flour turns light yellow. Remove it from the heat. Set aside to cool down. Measure each wrapper around 20grams and filling 30 grams. And then shape both of wrapper and filling to balls. Prepare the dusting flour, filling, wrapper and mooncake stamp. Assemble the mooncake stamp well and then dust with flour. Shake off extra flour and set aside. Wrap the filling with wrapper and seal completely. And then shape to a ball firstly and further to an oval. Place the oval to stamp (unsealed side first), flat with bottom with fingers; push the shaping tool to stamp the flowers. Then demold carefully. 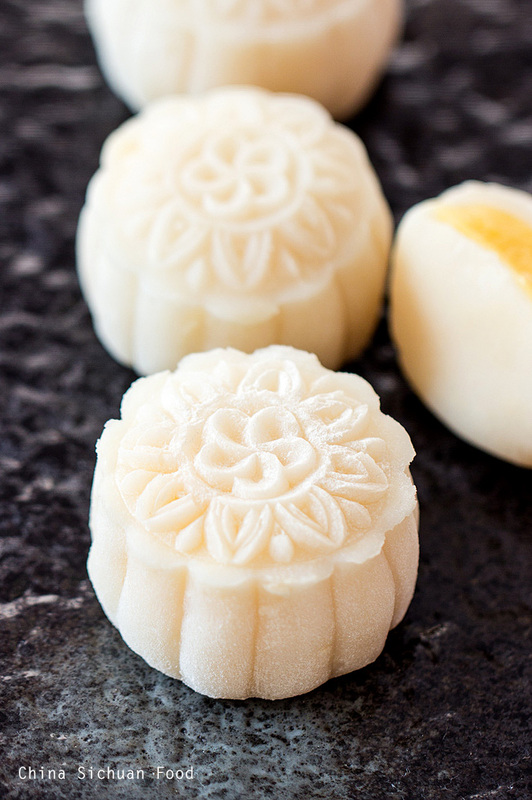 If you find the mooncake is sticky on the stamp, use the other hand to help separating. Those snow skin mooncakes need to be stored in airtight wrapper or container separately; otherwise, the surface will dry out. The best enjoying time is the next day after assembling. If you want to frozen them, they can be frozen up to 1 week but move to refrigerating area several hours before serving until they are soft back. love your recipes and videos!! Thank you! You are the most welcome. Michele. Happy cooking ahead. Thank you. Happy cooking ^^. Thank you for the video! It is simple & easy to follow. I have a question: for the milk, what kind of milk do you use? can I use fresh milk? thank you. I use normal milk from supermarket. Fresh milk is perfect! Happy cooking. May I ask why need to set aside 30min before steam? 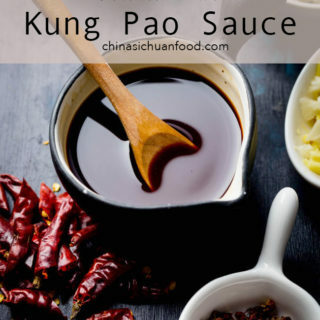 This can help the ingredients combine well and we can get a much fine and smooth texture after steaming. I did not use corn starch in my mooncake dough before but I think it should be fine. You are the most welcome. Good luck and happy cooking. Thanks so much for posting this recipe. I’m dying to try it out but I don’t have a food scale. I know that is the most accurate measurement. However, can you give the the closest measurement in terms of American measuring cups & spoons? Plus if you want to use salty egg yolks, is it the same proportion of eggs? Thanks so much for any help you can give. Thanks for the suggestion. I will try to provide a closest measurement in cups and spoons. But I still highly recommend measure the ingredients with a kitchen scale. It is low gluten flour. The plastic molds are so pretty, come in a variety of flower stamps, and can be ordered for only about $5 on Amazon.com. Would standard sugar cookie dough or any other kind of shell work for other times of the year? Would make a lovely Easter treat. That’s right David. The molds are quite simple but very helpful. thanks for the vedio i love it good job. on your wrapper ingredient does not have cake flour, but on the recipe you mention cake flour? do you mean both the glutinous rice floor and rice floor? or just the rice flour? cos i know the glutinous flour is also got the costing flour. do you mind to clarify them? Cake flour is only required for the filling, not for the wrapper. We will need to mix both glutinous rice flour and rice flour in the dough mixture. I have updated the recipe. Hope it works for you. can i tint the snowskin with green tea powder? do i still steam it? Sure, Melina. You can mix green tea powder firstly with the mixture and then steam it. Hi, I enjoy your video. I tried following it but my outcome was that the wrapper is sticky to eat. What is wrong with it? Pls advise. Thank you! You will need to knead the steamed dough until elastic. May need several minutes. Insufficient kneading will cause the wrapper sticky. Hi, inspired by your post. May I ask glutinous rice flour, does it means “Kou Fen”? And if yes, what should the proportion be if I only have Kou Fen and Hong Kong Flour? Do I still need to steam the mixture as I was told Kou fen was a steamed flour. Thks for your advice. Do you mean Gao Fen? Cooked glutinous rice flour? If it is steamed, then you just mix all the ingredients and knead well. 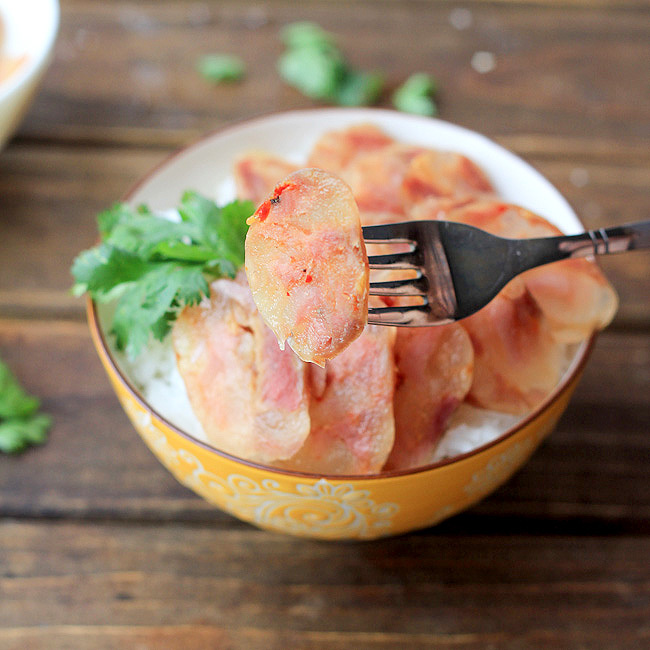 If I use Gao Fen, does it mean that the rice flour and wheat flour do not need to be cooked? So I mix Gao Fen, wheat starch and rice flour and knead with milk and oil? Yes, K. If you using Gao Fen for dusting. There is no need to cook them anymore. Sorry, one more question. For the wrapper, can I replace rice flour with all purpose flour? So I use Gao Fen, all-purpose flour and wheat starch and just knead them with milk and oil? Can I also ask why do you use oil instead of shortening for the wrapper? Sorry for the questions, I hope you coukd advise me. Thanks! No, sticky rice flour cannot be substitute by all purpose flour. 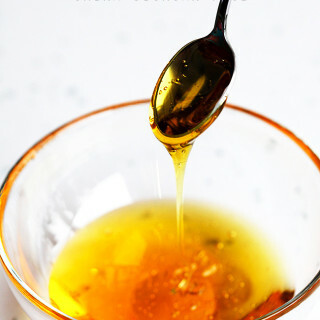 The purpose of adding oil is to avoid the wrapper drying out or lengthen the drying out process. We do not need to make the wrapper crumbly shells. Love this mooncake recipe! Tried it once and everyone loved it. Doing it again for this coming moon festival! Thanks Ka for the lovely feedback. I am making this again this year as my Mid-autumn gift. Glad to know you and your family love this too. Happy Mooncake day! May I know why do we need to refrigerate the dough for 4 hours ? Refrigerating can help to make the dough less sticky so you can assemble them easily. I tried to knead for quite a long time and dough looks glossy and is super stretchy but dough does turn oily. Am I doing the right thing? Have I knead enough? Is there any water dropped during the steaming process? If the dough is sticky after long time kneading, too much water or insufficient steaming time might be the reasons. You can add some cooked glutinous rice flour to the dough and re-knead. You will get around 340g wrapper using this recipe. It’s ok to slightly adjust the wrapper and filling ratio. It is quite normal for the filling to be slightly sticky. You can wear plastic gloves when assembling the mooncakes. I do not think adding other ingredients can save the filling. Have you heated the filling enough? Hi thanks for ur quick reply. Does it need to be boiled completely? I dun think I see mine boiling cos the bottom was slightly burnt n I stopped the cooking. Then I guess your filling is hot well cooked. 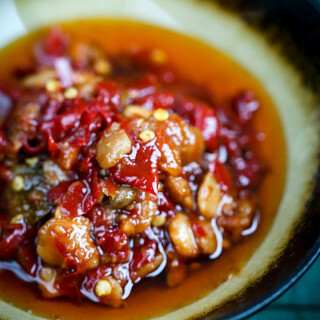 If you feel it is slightly burnt, keep the pot away from the heat and stir for a while, then re-heating again. You need to stir them quickly when heating. Hello, your moon cake looks wonderful. Just wondering could i buy it from you? I want to send some to important friends in Chicago. If i could, please contact me at 2156068808, really appreciate that. Thanks so much for the comment. I really hope that I can send some to my readers. But I am based in China so shipping to Chicago seems impossible. I am so sorry that I can’t help. Happy Mid-autumn day! Thanks your response, didn’t recognized you are in China, Happy Mid-autumn day! Hi Elaine, just made this recipe! I am wondering, how do you say custard in Chinese? Hi Elaine, can I substitute the shortening to butter? I only use butter in this recipe. Which shortening? You are the most welcome. But may i refrigerate the wrapper for a night ? Cos im afriad that i dont have enough time …so i think i will do the wrapper first …than keep it in refrgerate for a night .? If you want to make the wrapper ahead, the mooncakes should be eaten up in the following day. We uses grams instead of cup, Understand that Cups for DRy and wet ingredients are different. Able to convert them to grammage. I list most of the main ingredients in actual grams. For some small amount ingredients for example custard powder, tablespoon and teaspoon should be more convenient. Thank you! If i want to add colour to make colour snowskin mooncake. When should i add the colour then ? You can knead the color when during the kneading process after steaming. 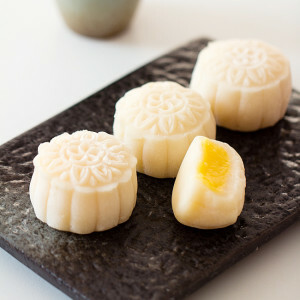 This recipe looks wonderful, I bought the mooncake molds and I can’t wait to try it. 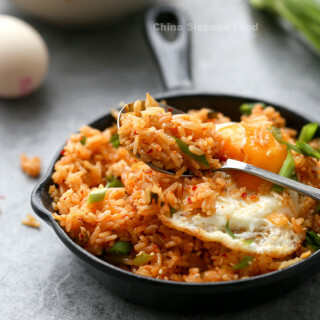 I can’t seem to find wheat starch in my area, is there anything else I can use? corn flour or regular white flour maybe? You can use cornstarch as a substitute. But the mooncake should be less transparent. Amazing recipe and excellent instructions. Love everything about it. I like the recipe very nice… can I ask how can make the pastry harder… if too soft some people don’t like.. how can make harder. Thank you I learn a lot from you. 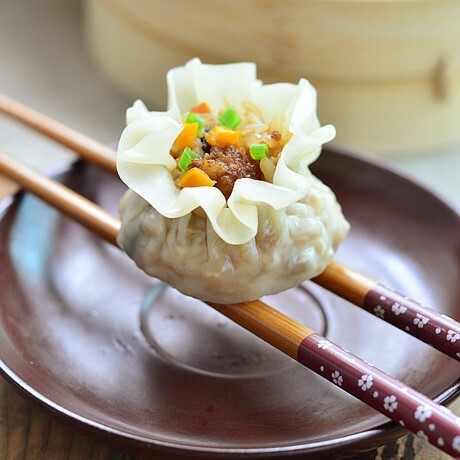 After assembling, place the mooncake in fridge and the skin will become harder after chilled. You can try it. I can’t wait to try it! Two years ago I made the traditional Cantonese mooncakes. Last year I made those again, and also Taiwanese “swirled’ taro mooncakes. 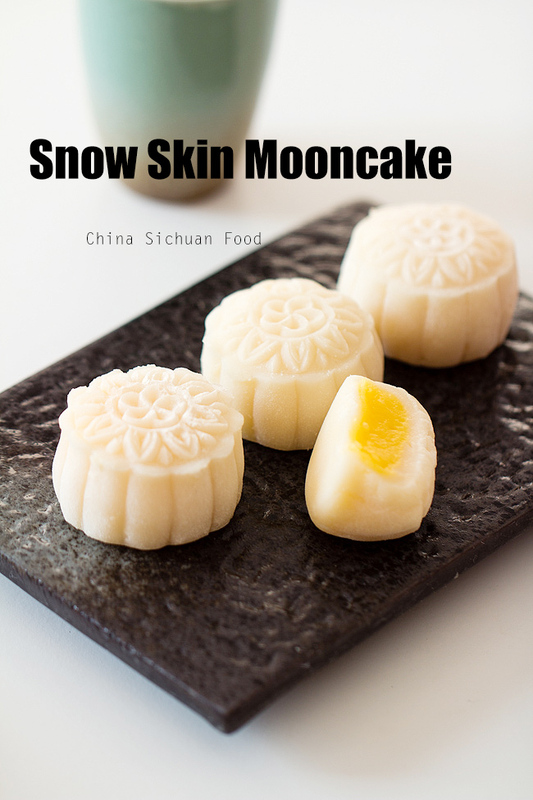 This year I want to try making snowskin mooncakes. I will share them with my friends during the Moon Festival while we have Gongfu Cha. I love your tutorial. Very easy to understand. I just made the wrapper, it’s very oily. Is it supposed to be so oily? The custard is great! my kids already pinched a lot haha! The wrapper can be slightly oil firstly, but not very oily. But it will become dry very soon after chilled. 2. 100ml Milk, Full Cream Milk or Fresh or else. You can use coconut milk to replace milk. We only need to stir fry the dusting rice flour. We use raw glutinous flour for the wrapper since we will steamed the dough later. Thanks for sharing your recipe Elaine. Can I know if the glutinous rice flour you use to make the wrapper is raw or cooked? The flour for the wrapper is raw since we will steamed the dough later. But the dusting glutinous rice flour is cooked previously. I only has salted butter, Is it alright to use salted butter in the custard filling? Thanks. Hihi, is it ok if I use salted butter for the custard filling instead of unsalted? Thank you. No, Agnes. It spoils the taste. Thanks Elaine. Another question to ask, For the 2 eggs (100g) is with shell on 100g or just the eggs weight without shell? I am using 60g egg (with shell) so I need use 2 eggs or 1 egg + 1 yolk? Thanks. Egg liquid 100g. So 2 eggs are enough. Hi Elaine I made the wrapper yesterday and tonight we thought eating as dessert, the whole skin hardens and cracked. What went wrong? Thank you. 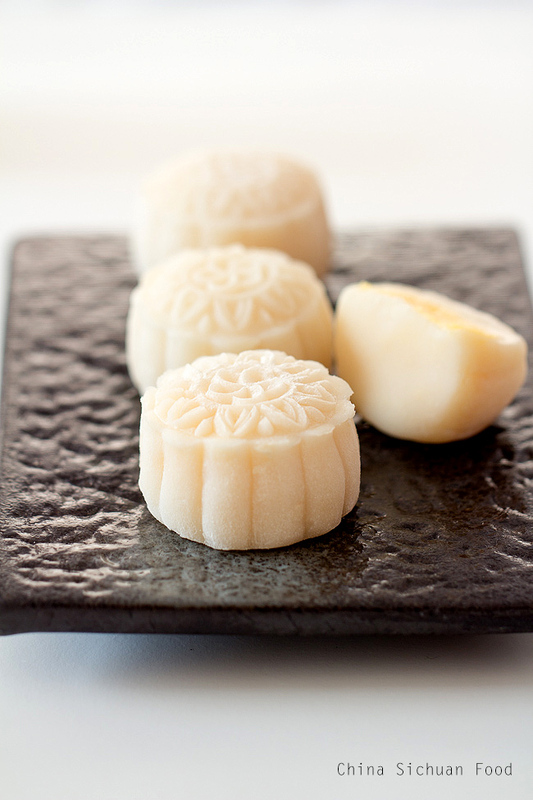 If the mooncakes are well packaged in air-tight container, then you need to knead your dough for longer time. Can you fill with red bean instead of custard filling? 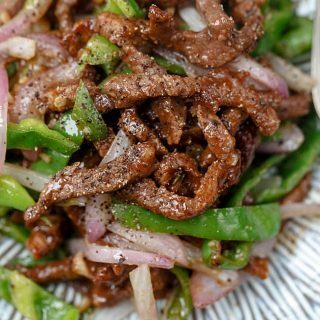 If so, can you what brand/recipe for red bean. Yes, red bean paste if a great option for snow skin mooncakes too. Check this for the recipe.